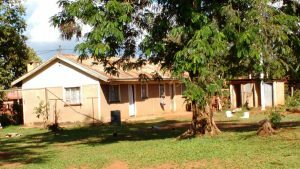 The two main health projects are at St. Bakhita Health Clinic and Namboboto Health Centre. These provide much needed healthcare for the local people. W.O.R.K. 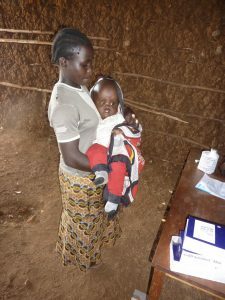 is also involved in outreach work to people who do not have the money or transport to get to a clinic. 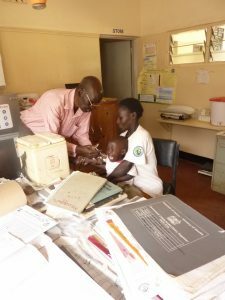 This has included removing jiggers (tiny worms that eat into flesh) from children’s feet and hands, testing children for HIV and taking a mobile clinic to remote villages to provide care for pregnant women, babies and others in the villages. It is difficult to employ staff in very rural areas unless there is accommodation available so W.O.R.K. has built staff houses at the health clinics. This ensures that good staff are always on hand. Some people are able to pay a small amount for their health care, others contribute something as part payment – perhaps a few eggs or vegetables. No-one is turned away. 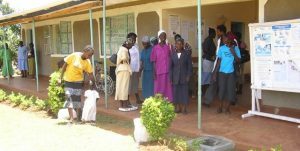 The fees from those who can afford to pay mean that the very poorest widows and orphans who have nothing can receive health care. As the health centres have grown more wards have been built and equipped. At St. Bakhita there is now a theatre for minor surgery and 40 beds for in-patients as well as the out-patient facilities . A constant supply of electricity to clinics cannot be taken for granted upon but solar lighting provided by W.O.R.K.means that there is a reliable source of electricity and midwives can deliver babies in the night.